Pre-E3: Fallout 4 Rumor Mill. Next week, at E3 2015, Bethesda is set to unveil all kinds of information about Fallout 4, over here we took a further look at the announcement trailer and now it is time to read up on all of the crazy ideas that have popped up since then just in time for E3 2015! About a year ago, rumors started swirling that Bethesda employees were found in Boston taking pictures of famous landmarks. In Fallout 3, one of the larger side quest, called “The Replicated Man,” saw your character be enlisted by Dr. Zimmer to help track down a run away android. Dr. Zimmer comes from The Institute to find the android who escaped from the Commonwealth, an advanced civilization that lives to the north of the Capital Wasteland. During this mission you meet a woman named Victoria Watts who represents The Railroad, an underground organization that aids escaped androids from the Commonwealth. Through this mission we learn that The Institute and The Railroad are opposing factions that reside within the Commonwealth. The Institute are those responsible for the advanced technology in the Commonwealth due to them originating from or taking over a post-apocalyptic MIT. The Railroad is a small underground faction that aims to support Android’s civil rights. Though the Commonwealth is referenced constantly throughout this mission, we never travel to or see anymore citizens from the Commonwealth again. 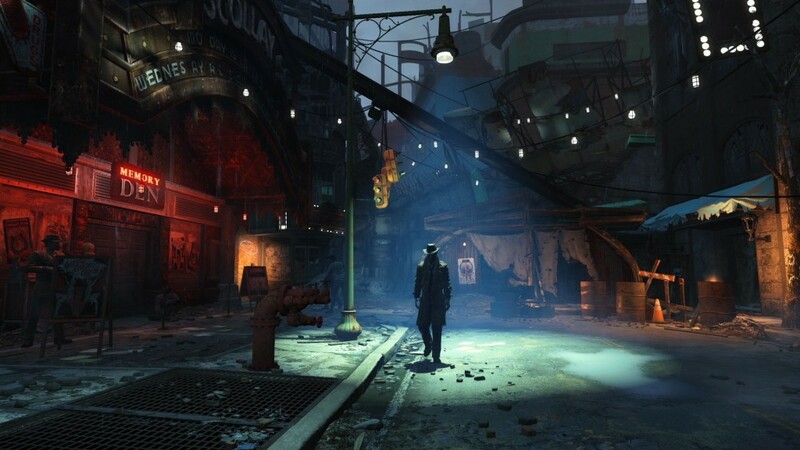 Now, Fallout 4 will take place in the Commonwealth and it’s surrounding Boston area. It is currently unknown exactly how much the main character will talk in the game or if he/she will even talk at all. Traditionally the main character has not had a voice, except for a few pain grunts, but with the voice sounding like that of Troy Baker or Nolan North it is hard to believe that Bethesda would bring either of those guys on just for a trailer. Now to read in between the lines and make some educated guess! The baby is the playable character. We saw in the trailer that one family in particular was paid very close attention to. In the past we saw the family that used to live in the house where the dog was sniffing around at the beginning of the trailer. The flashes back to the past followed around this family and we last saw them outside Vault 111 while a bomb dropped close by. This has lead to many believing that the family is going to be a main part of the game and some believe that the baby was your actual character. In the future you see a book laying on the floor of the baby’s room. This book looks to be the “You’re SPECIAL!” baby book from the beginning stages of Fallout 3. In Fallout 3, Vault 112 (Tranquility Lane) had cryogenic and virtual reality technology. It is possible that Vault 111 would have an earlier version of cryogenic technology as well. This would allow for your character to be around since the bombs fell. Some others believe that the baby was your Grand or Great Grand Parent. Meaning your family would have lived in the Vault for 2-3 generations, allowing for the time since the bombs dropped. In the Fallout universe, the bombs fell on 10/23/2077, Fallout 1 begins on 12/5/2161, Fallout Tactics begins on 1/1/2197, Fallout 2 begins on 5/15/2241, Fallout 3 begins on 8/17/2277, and Fallout New Vegas begins on 10/19/2281. Based on the pattern of time, Fallout 4 will take place soon after Fallout New Vegas. Some think Fallout 4 will take place along side Fallout New Vegas, happening shortly after Fallout 3. 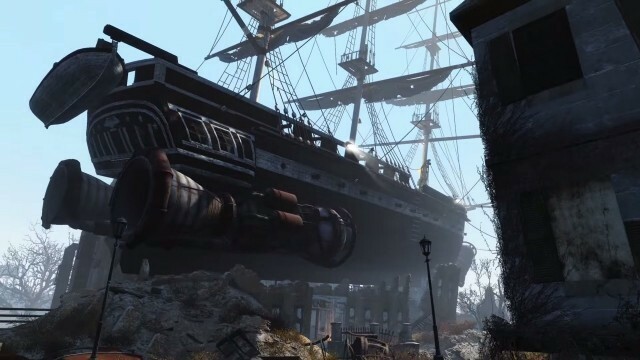 When the announcement trailer takes us on a tour around the Boston Wasteland, we see the USS Constitution on top of some destroyed buildings and a Submarine/Cargo Ship beached inland. One theory proposes that in 2077 a bomb hit off the Boston coast and caused a tidal wave to sweep these ships inland. The USS Constitution was nicknamed Iron-sides because of it thick walls, this is a possible reason as to why a tsunami wouldn’t completely destroy the ship. Another theory proposes that the ocean has dried up a lot and the submarine/cargo ship is laying at the bottom of the Boston Harbor. As we see, the USS Constitution now has two huge engines attached to it. The ship could have landed on those buildings by a failed attempt to make the ship fly. After Fallout 1, the Brotherhood of Steel creates airships to explore the rest of the United States Wasteland. Many airships were deployed but destroyed before they could reach their destination. In Fallout 3, the Brotherhood that appears in the game originated as traveling from the west in an attempt to find the Midwest group, a group whose airship failed. 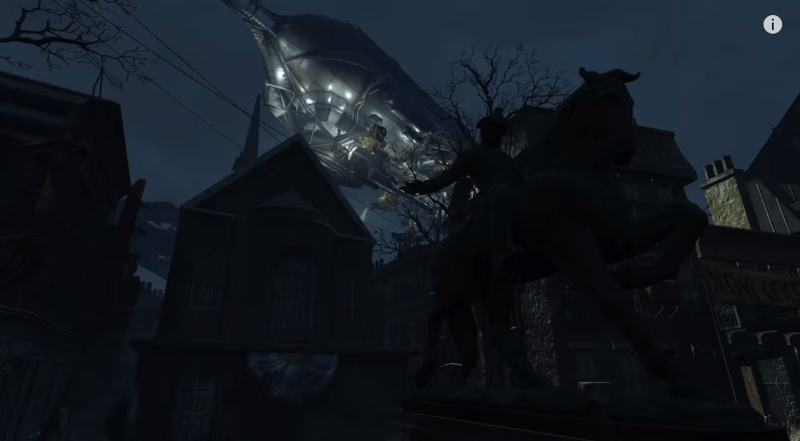 Is it possible that one ship made it and went all the way to Boston and that is the airship we see in the trailer? Or is it Commonwealth technology or salvaged from a Brotherhood ship? The Garage, let’s look a little more at that garage. 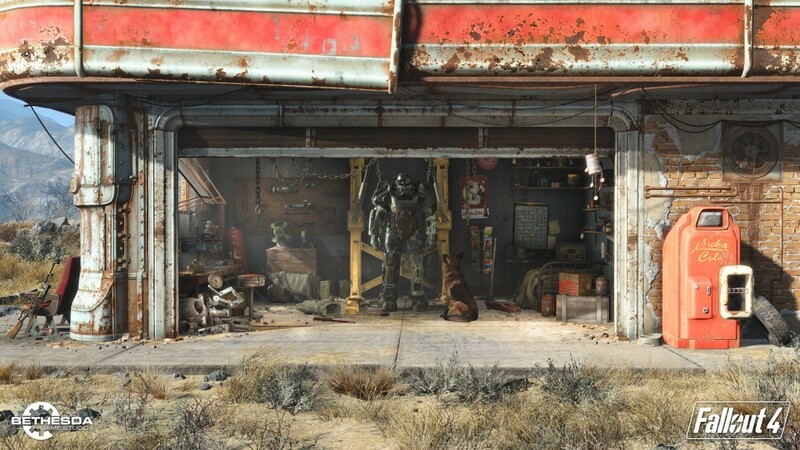 Fallout 4’s first official 4K screen shot gave us a picture of the garage that the dog past by at the end of the trailer. In this shot we see many things that could mean many things. Moving from right to left, we see a Nuka-Cola machine and a bottle cap wind chime. Looking inside we see a bed with some various past Fallout items around it, and a poster that says “VAULT-TEC” on top. It seems to have the icons of all of the perks. This could be the place that you choose perks or it displays the perks you have. Moving left, we see a magazine rack. It looks like we have a place to keep all of the magazines and books that we can collect out in the wasteland. Moving more left, we see the under construction/repair Power Armor with the Dog looking at it and then we see some weapons up on the wall and on the floor, we will look at these in a second. Under the weapon wall there is a nightstand, with a Bobble Head on it. Hopefully the Bobble Heads have returned! If you look at the workbench to the left of the nightstand, you can see a Pip-boy resting on top. A Mr. Handy shut down to the side of the table. Moving all the way left, we see a rifle leaning against a bench. Modding: Looking around, there are many, many indications of modding being a feature in Fallout 4! First off, the Power Armor. The top half is traditional Brotherhood of Steel, but the rest looks scavenged, which would make realistic sense. Only the Brotherhood has Power Armor but why not make your own? Besides creating, it looks like you can modify and repair as well. The right leg of the armor is missing but you can see the intact leg laying on the floor to the left with a hammer and wrench next to it. Looking at the weapons on the wall, you see some tools to the left, but around the laser rifle looks to be a new stock under it, a sight the bottom right, a barrel to the top right, a magazine on top, and something big to the top left. The mini-gun and ammo crates can be seen on the floor but the mini-gun is covered with a blanket so we can’t see all of it. The Pip-boy on the repair table and the lack of a logo on the Pip-boy may indicate that it is a built Pip-boy knock-off. The Mr. Handy on the floor looks to be missing some pieces, possibly from salvaging. Finally, the rifle outside. That is not a normal looking rifle! It looks to be the rifle that the main character was holding in the announcement trailer. It has a wooden stock like a hunting rifle, but a laser firing mechanism, and some type of scope or disjunctive barrel. Finally, a question that is most present among fans, is this a home base for the main character or is this simply an example of what your home could look like? Bonus: Did Doctor Li make it to the Commonwealth? 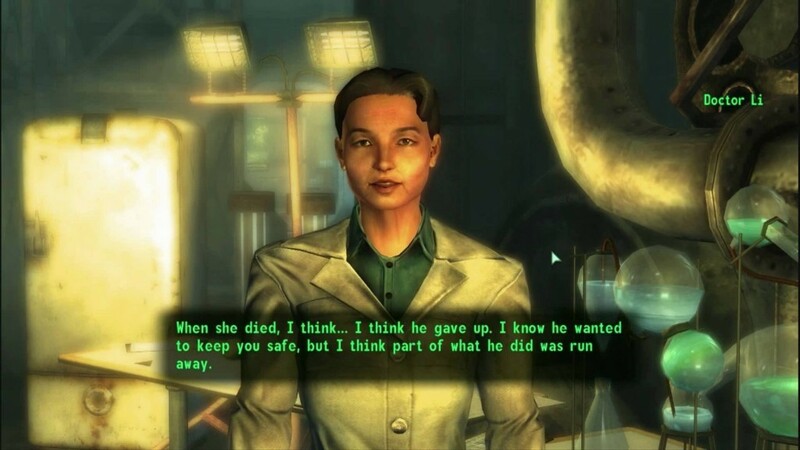 In the aftermath of the Fallout 3 main story line, a prominent character, Dr. Madison Li, leaves the Capital Waste and is said to have set out for the Commonwealth. If she made it, she could appear in Fallout 4.